The Holy Experience is about the moment when we know at last that we and God are one. It is about how to step into that moment, how to access the experience at any time, and about the promise of being able to remain in that experience forever. Many people have had this experience (the experience of being Everything) momentarily. They have had it in meditation, perhaps, or in a time of pure silence, or in the midst of an impactful interaction with another (such as sexual union or laughing until tears come, or weeping together), or walking alone through the woods on a sunlit morning, or swimming in the ocean, or, simply washing dishes. 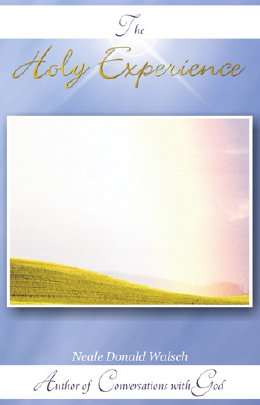 I call this The Holy Experience. It is when you know Who You Really Are. While many people have had this experience momentarily, the trick is to have it continually. Or at least a great deal more of the time. That was the yearning of the Buddha. It was the journey of the Christ. It is the opportunity placed before each of us. Many Masters have shown us the way. The way is for us to BE the way. Now you can receive an extraordinary book written by Neale Donald Walsch especially for this website. Using the power and outreach of the Internet, we intend to share this book with millions of people worldwide -- absolutely without cost. Once you click submit, a new page will open with a link to download this eBook. PLEASE NOTE: By registering above, you are giving us permission to send you occasional news of interest to CWG readers. You will receive an email to confirm that you are being added to our email list. If you do not reply to or click the link provided in that email, your email address will not be added. You may unsubscribe at any time. Your information will be used by this website only. It will never be given away or sold.